I recently posted a recipe for Overnight Slow Cooker Oatmeal, which I made twice last week. My husband and I were totally diggin' that recipe ... that is, until I switched things up today and used steel cut oats (instead of old-fashioned oats). Instant oats are terrible overnight in the slow cooker (way too mushy). Old-fashioned oats worked pretty good (not quite total mush, but not super hearty and well-textured either). But, steel cut oats ... oh my goodness! I am in love! If you have never heard of steel cut oats or have never looked for them in the store, let me give ya a little info on them and what to look for. They are a tad pricier than your everyday, run-of-the-mill oats, but not by much. I paid $3.59 for my 24 oz. package at Kroger in the health food/organic section. I purchased Bob's Red Mill brand. Another well-known brand that is usually easily available is McCann's (my Wal-Mart has it in the actual oatmeal section), but it is a little more expensive compared to Bob's. I've, also, seen steel cut oats in bulk at places like Whole Foods and health food stores. The difference between rolled and steel cut oats is that while both contain whole grain oats, they are processed differently. Rolled oats are steamed, rolled, steamed again and toasted. They end up as thin flakes. Steel cut oats are made from oat kernels that have been chopped into thick pieces. 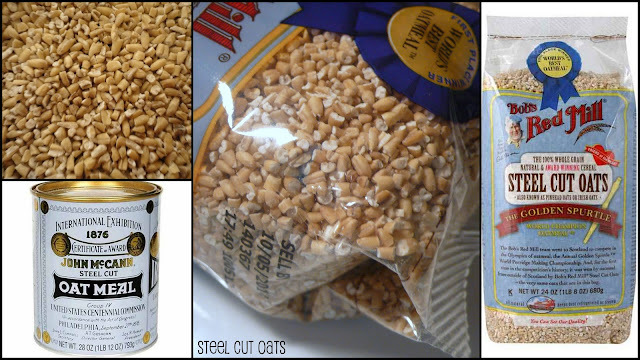 Using steel cut oats produces a chewier, heartier texture that is somewhat nutty. And, they hold up wonderfully to the long process of overnight slow cooker cooking. The recipe I used is very similar to the one I posted recently using old-fashioned oats. I use a loaf pan placed into my slow cooker insert and create a water bath. This prevents dried-on oats and is much easier clean-up wise. I adore that I spend just 10 minutes at night throwing this together ... and we wake up to a ready-made breakfast and a house that smells divine! What could be better? Add in any fruit (fresh, frozen or dried) that your prefer - about a cup. (Best if fruit is placed on top of the oat mixture and not stirred in.) Blueberries, apple chunks, raisins, dried cherries, peaches, bananas ... whatever your fancy is! Place a ball of crumpled foil on the bottom of your slow cooker. This will help sturdy your pan if it doesn't quite sit stable enough in the slow cooker and will prevent the pan from sitting directly on the bottom of the slow cooker insert - avoiding possible burning. Place a greased bread loaf pan (I used a metal one) on top of the crumpled foil. Add in the oats, salt and brown sugar. Pour in the milk, water and vanilla. Add the butter. Stir. Top with the cinnamon (and any fruit you're using). Do not stir. Lid and cook on low for about 5 - 6 hours. (Turn the slow cooker to warm as everyone trickles in for breakfast.) Give the oatmeal a gentle stir. Sprinkle on some more brown sugar if a sweeter taste is desired. Serve with milk, if desired. UPDATE 4-9-14: Since this post, I have made several versions of overnight steel cut oats in the slow cooker. Setting the slow cooker to the warm setting from the very beginning and cooking for 8 - 9 hours yields perfectly cooked oatmeal, as well. This looks delicious! I was wondering if you need to use the foil if the loaf pan fits flat on the bottom of the slow cooker. Also, how high up should the water reach on the outside of the loaf pan? I use the foil so that the pan does not come into direct contact with the bottom of the insert. I was afraid that it might scorch the bottom of the oatmeal wihout a barrier there. I figured that putting the foil down as a barrier allows for a more-gentle cooking of the oats. I have never tried it without using foil. I add around 2 cups of water to the bottom of the insert. Thanks for your response! I made this last night with mashed ripe bananas and my husband, one year old son, and I all loved it! We will definitely be using your recipe again and experimenting with different fruits. Thanks for posting this yummy recipe! I am so excited to try this. I love steel cut oats but never wake up early enough to make and enjoy them before work. What size crock pot do you use? Our's is a big 6-quart one and I'm curious if I should use more water in the base. I believe mine is that same size and I've never had an issue using the amt of water called for. Hope you enjoy! :) Thanks for the question. Thank you so much for this great recipe! I only have a small slow cooker that is a 3 or 2 quart size so my bread pan wouldn't fit into it. I just lined it with tin foil and cooked it on low for about 7 hours. It turned out delicious! I can't wait to try different fruit next time! I've made this a couple of times now and my kids love it - only one of the four would eat oatmeal before now. I used Bob's Gluten Free Quick Oats, because I couldn't find a gluten free version of the steel cut ones. I forgot to put the vanilla in the first time and it tasted fine, so I've continued to omit it. The first time I made this we had just moved so I used my small 1-/2 or 2Qt one without the water bath. Being a night owl, I put everything in around midnight and we get up at 6am so, I just set the crockpot on low, it turned out okay. Thanks for a great recipe. Yeah! So glad you enjoyed it! I've posted a few other versions of my overnight oats recently. You can check those out if you'd like under the Breakfast section on my Recipes page. :) Thanks for the feedback! I actually typically go to bed between midnight and 1 a.m. (sometimes even later - total night owl here). :) Then, I have to get the kids up around 5:30 for school. Once they leave at 7, I sometimes catch a couple more hours sleep if I'm feelin' tired. I'm just one of those folks who do better on 5 - 6 hrs of sleep. I actually should update the recipe - now that I've been making several versions of steel cut oats in the slow cooker since this post, I've discovered that the slow cooker can be set to the WARM setting for from the beginning for 8 - 9 hrs and everything cooks perfectly! Great for those who go to bed at a normal hours! HA!